Whenever coherent actions of two physical systems are observed, one may wonder what is the nature of their interactions. Nonlinear interdependence  was devised as a measure of the coupling strength for stationary systems, sensitive to the direction of the interaction. Straightforward application of this measure to evoked potentials is not possible. This is because such signals are typically too short and the system cannot be considered stationary over relevant time scales. We proposed  as a way to apply nonlinear interdependence and other measures devised for analysis of stationary signals to evoked potentials. The approach is to concatenate well-localized evoked potentials and study a pseudo-periodic time series obtained this way . Suppose now we have two pairs of transient signals, such as evoked potentials from thalamus and cerebral cortex in two behavioral situations (attention and relax). Can we tell if the coupling between the structures is different in these two situations? We tested our approach on a simple population model of thalamocortical loop. The model consists of two coupled Wilson-Cowan structures, each of them comprising an inhibitory and an excitatory population . One structure ("thalamus") receives external stimulation, which is either zero, or a short pulse. We vary the strength of the connections from "thalamus" (Th) to "cortex" (Cx) in order to model different attentional states within the loop . In the case of no stimulation, the nonlinear dependence measure H introduced in  can be applied directly. In the other case, we use our "cut-and-paste" approach to infer the strength of coupling. The results of the numerical experiment are presented in figure 1. For null stimulation, the measure H does not detect any changes in the coupling strength. 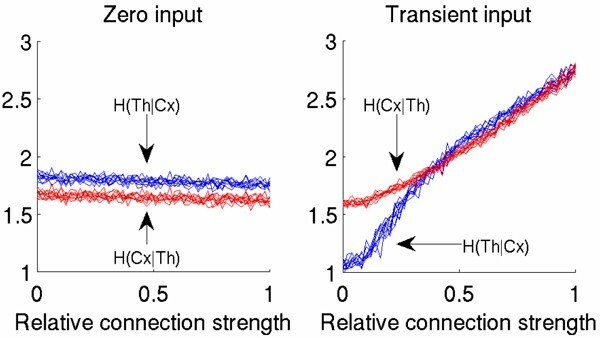 However, in application to evoked potentials, it can be seen that H is an increasing function of the coupling strength between the subsystems. Therefore, our approach is a viable solution to the problem of data-based quantification of the coupling strength. This research has been supported by the Polish Ministry of Science and Higher Education under grants N401 146 31/3239, PBZ/MNiSW/07/2006/11 and 46/N-COST/2007/0. SŁ was supported by the Foundation for Polish Science.